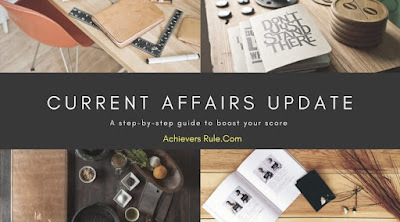 Current Affairs Updates for 5th april 2018 consists of all the important news headlines which are important for the upcoming government examinations like IBPS PO, IBPS CLERK, SSC CGL, SSC CHSL and Rail exam. Some of the important headlines of today include the Whatsapp service used by IndusInd bank, Himanta Biswa Sarma being elected as BAI President, International Mine Awareness day being celebrated on 4th april. Aspirants should go through the Daily One Liner and Static GK and Note Down Points for better improvement in the examinations and also to boost their knowledge. We hope you will find our article useful. Ajay Kumar Singhania was elected the Secretary General while former Tamil Nadu Badminton Association president and former Union minister Anbumani Ramadoss was elected treasurer. Both were elected unanimously. A Chinese energy conglomerate and SoftBank Group Corp. signed a 930 million dollar agreement to produce and sell solar equipment in India, a country that is trying to bolster local manufacturing and curb reliance on clean energy imports. Golden Concord Group Ltd. will invest in a 40 percent stake in the joint venture, with Japan’s SoftBank taking the rest, according to a March 31 statement from a unit of the Chinese company to the Shenzhen Stock Exchange. A joint venture of Reliance Jio and SBI (State Bank of India), Jio Payments Bank has started its commercial operations from Tuesday. Jio Payments Bank was one of the 11 applicants that were issued in-principle approvals to set up payments banks back in 2015. The train left for Bangladesh with 60 containers loaded with almost 1,200 tonnes of de-oiled cake, used as a raw material for animal feed. As per the plan, the government would merge DGS with the Directorate General of Antidumping and Allied Duties (DGAD), the investigating arm of commerce ministry, to streamline the process of imposing trade remedies. Three trade receivable discounting systems (TReDS)—digital invoice discounting platforms—approved so far by the RBI have jointly implemented a blockchain solution, which is expected to help reduce frauds in bills discounting or receivable financing. But through a quirk of nature that tremendously amplifies the star’s feeble glow, astronomers using NASA’s Hubble Space Telescope were able to pinpoint this faraway star and set a new distance record. They also used Icarus to test one theory of dark matter, and to probe the make-up of a foreground galaxy cluster. Chamling is on a 32-day tour of the Himalayan state, beginning from the sparsely-populated North Sikkim district to gauge the popular mood ahead of the assembly polls due next year. The Airports Authority of India (AAI) and Construction Industry Development Council (CIDC) have signed a memorandum of agreement (MOA) for financial assistance for employment oriented training and skill development programme for SC/ST/OBC/women, unemployed youth and people belonging to economically weak sections (EWS). This CSR initiative of AAI, to be implemented during 2018-19, will have 2,000 beneficiaries, said the authority. The 16 APAs entered into during March, 2018 pertain to various sectors of the economy like Telecommunication, Information Technology, Automobile, Pharmaceutical, Beverage, Trading, Manufacturing and Banking, Finance & Insurance. The first MoU between HDFC Bank and the Indian Army was signed in 2011 and was renewed on 13th March 2015. New Delhi will host the strategically important trilateral dialogue between India, Japan and the US this week ahead of the summit between US President Donald Trump and Japanese Prime Minister Shinzo Abe at Mar-a-Lago later this month, the State Department has said. India's Selena Selvakumar and Shreya Shivakumar produced a rich vein of form as they fetched two bronze medals at the 2018 Ivory Coast Junior and Cadet Open Table Tennis Tournament in Abidjan. Shyam S Salim, Principal Scientist at the Central Marine Fisheries Research Institute (CMFRI), has been elected as a regular executive member of the International Institute of Fisheries Economics and Trade (IIFET) based in Oregon State University, USA. IIFET, which is a global organisation consisting of more than 700 members from over 65 countries around the world, provides an international forum for the exchange of research, information, and ideas on the economics of fisheries management, seafood trade, and aquaculture.